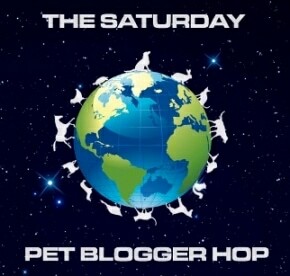 Lexi, Nitro and I are very excited to participate in this week's Saturday Pet Blogger Hop. Special thanks goes out to our Blog Hop hosts, Life With Dogs, Two Little Cavaliers, and Confessions of the Plume. Since we have to find fun things for Nitro to do while his left paw is healing (he has to be on a leash at all times), we decided to take advantage of the beautiful warm spring weather and visit Panera and Starbucks over lunch time on Saturday. It was 78 degrees and all the local fruit trees were in full bloom. Our first stop was Panera for their totally yummy BBQ salad. Check the bottom of this post for great dining tips for you and your canine. Photos below are of us dining with our deaf boxer Nitro. He has the best manners for a 7 month old! I always carry a blanket for Nitro to lay on so he relaxes and holds his "stay" command. My sweet husband Chris (Nitro's human daddy). Nitro chilling next to his daddy. Nitro and I relaxing after lunch at Panera. Nitro was such a good boy while his daddy took our photo. Nitro just checking out all the people coming into Panera for lunch. Check out the reflection of the trees in full spring bloom! Here is a photo of Nitro chewing on a Starbucks cardboard cup holder. We are giving him different things to nibble on so he will start using his left paw to grip objects with his weak toes. He has a lot of atrophy in his left paws so by giving him things to grip this will help rebuild his muscles in his toes. He doesn't eat the cardboard he just chews on it and then spits it out. I have also been giving him large rawhide bones so he can grip them with his toes to build his muscle up. It is like doing physical therapy on his left paw. Spring flower display on the outdoor patio at Starbucks. Nitro laying on his blanket in the shade at Starbucks. Today Nitro started back at class at Field of Dreams Dog Training Center. He was very focused and he did very well on all the tests the instructor put us through today. I was very proud of him considering he hadn't been to class in over two weeks and he has been on a leash attached to me the whole time because of his injured paw. Remember, taking your dog out to dine with you to a restaurant is a privilege and not everyone at the restaurant will be as excited as you are to have your dog there. Only clean, exceptionally groomed and well mannered dogs should be accompanying you out for a meal at a restaurant. Patio dining with your dog is offered solely as a courtesy by individual restaurants. If your dog does not know the basics commands of Sit, Lay Down and Stay, get your meal "to go" or leave your dog at home or in the hotel. * Barking is not welcome. Lexi, Nitro and I wish you Happy Dining! This is a great post Christina! Love the pictures of you three! Lovely spring... it's here! There was a place in Bristol Rhode Island, JP Goff's, loved that place, rude service, long waits for food, but right on the water and you could put your dog on the table if you wanted too (it was on a deck.) Then sane management took over. Dogs still allowed but the table thing is out. The old place did not like complaints. We were sitting near a group that felt their food was taking too long, one of them went to complain, and then he rushed back saying they had to leave now like their was a mob hit on them. Great reflection shot! Looks like a good time was had by all. I was just blog hopping through and wanted to say how much I like your blog. Nitro is very sweet and obviously well behaved. I envy you being able to sit outside - it's not warm enough here yet. Have a great weekend! We are waiting for some of that sunshine! Glad you could enjoy the great weather and dining outside with Nitro. I love taking Bunny out to places with me, too, and I always hope that somebody doesn't ruin it for us. Now if we could just get the weather to cooperate! BOL! I'm sorry but I just busting up laughing at rule stating your dogs shouldn't beg or clean up your plate. I can picture my husband letting both happen!! Manners for our dogs is not drooling before they get to clean the plate!! That was too funny. I am also so impressed with people who can teach their dogs such manners and can take them out to eat. I'm glad everything went well with Nitro. Hope his paw gets better soon. So glad Nitro is up to going back to class. We love dining out, too! Our fav place is a little cafe on the canal in downtown Indianapolis! Nitro is just sooooo handsome! Stopping by from the hop to say hello! Have a PAWsome weekend! Looks like an awesome day to eat outside with the pup. We don't have any dog friendly dining, so I always get something to go and sit on the riverfront with my pups on the sunny days. Just stopping in from the Blog Hop. Once again, great pics! I love Nitro. What a face! He is so very lucky to have you and your husband. After seeing how beautiful your website is and knowing you design I sure wish you lived here! I am afraid to do too much in fear it will be wrong even though I love watching design shows. I hope I get to see more of your work. BTW - Great dining tips! Looks like you all enjoyed a nice lunch. Well, you humans enjoyed the lunch. Nitro got to enjoy being with you. I love Outdoor dinners and Party...Thanks!!!! Great blog post. Thanks for sharing. i have read your article Outdoor Dining Tips For You And Your Canine Friends and photos it very nice and beautiful, thanks for sharing it is with us. Presence of virus or malware on your computer can be dangerous because they can cause a lot of damage. But here you will get help to remove this threat and all the suspicious program from your PC. This page consists all information related to W97M.Remkos. It will definitely help you to identify and delete from your PC. Search Manager or similar malware on your computer can be harmful because they can cause a lot of damage on your system. It is necessary to remove this threat and all the suspicious program from your PC.